Since this is such an easy recipe, I usually double it so I have quick leftovers for another meal. It’s also great to share with a small dinner group. 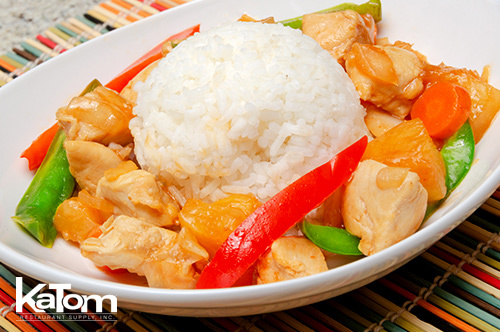 I usually like to serve my sweet and sour chicken over Jasmine rice, and ideally with a nice warm pot of green tea. If you want to dress it up a bit and add more color, top it with some fresh sliced cucumber and tomato wedges at the end of cooking. It’s fine to stir them in the pot just before serving, but if I’m making individual plates I like to arrange them like a garnish so you get a nice pop of color. Whatever version of this sweet and sour recipe you decide to make, you’re sure to have a delicious, easy meal that everyone will enjoy! Cut chicken in ½” pieces. Add oil to pan and brown the meat over medium-high heat. Reduce heat to low then add onion and garlic. Add carrots, bell pepper, water chestnuts and pineapple. Combine remaining ingredients and stir into skillet. Cover and simmer 10 minutes until thickened.